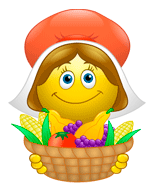 This pilgrim smiley has a basket of Thanksgiving cheer and good wishes to send to everyone you know on Facebook. Post her on someone's timeline or share her in a private message. You can even post this smiley to a comments section. Our emoticons are free to use, and they'll add lots of extra festivity to your Facebook time.